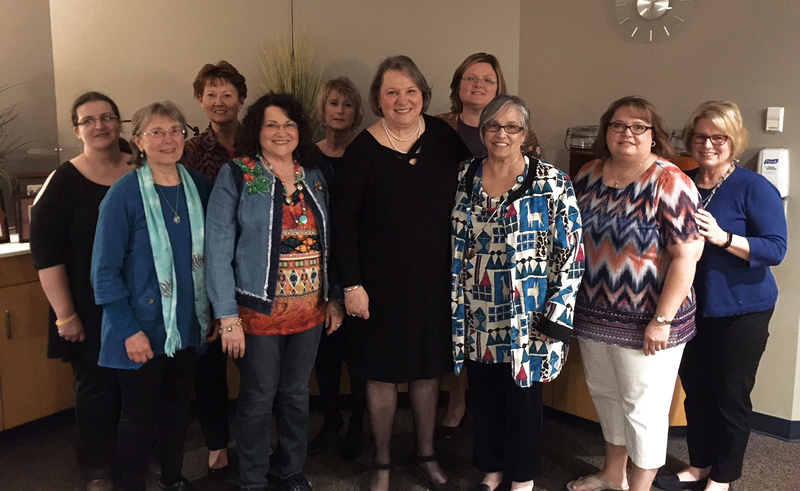 Friends and colleagues gathered at the West Virginia University Charleston Campus to wish a happy retirement to Alvita Nathaniel, PhD, APRN-BC, FNP, FAANP, Professor and Chair of the West Virginia University School of Nursing in Charleston. Dr. Nathaniel’s staff, peers and past and present faculty members took turns honoring her many achievements during her career. Speakers included Tara Hulsey , PhD, RN, CNE, FAAN, Dean and E. Jane Martin Endowed Professor, Vice President of Health Promotion and Wellness for WVU, Dr. Nathaniel’s friend and mentor Mary Jane Smith , PhD, RN, FAAN, Chair of Adult Health Department and Professor at WVU, and John C. Linton , PhD, ABPP, Associate Vice President and Dean, School of Medicine-Charleston, Professor and Vice Chair, WVU Behavioral Medicine. She was very touched by the tributes and thanked everyone for the wonderful atmosphere and collegiality she enjoyed throughout her time with the University. Dr. Nathaniel has been a member of the faculty at West Virginia University since 1987. Prior to assuming her position as Chair, Dr. Nathaniel was Coordinator of the Family Nurse Practitioner Track at West Virginia University School of Nursing. She has also practiced as a family nurse practitioner in free clinics and juvenile detention facilities for over twenty years. Dr. Nathaniel is active in public policy, and has published numerous articles in journals and other health care-related publications. She is also co-author of the book Ethics and Issues in Contemporary Nursing. Dr. Nathaniel is a Fellow of the American Academy of Nurse Practitioners, The Grounded Theory Institute, and the WVU Health Sciences Center Academy for Excellence in Teaching and Learning. She earned her Bachelor of Science in Nursing from Alderson Broaddus College and both her MSN and her PhD from West Virginia University.